Tucked down a cobblestone alleyway in the heart of Sydney’s CBD, PS40 is a small but perfectly formed cocktail bar that boasts its own soda production set up. 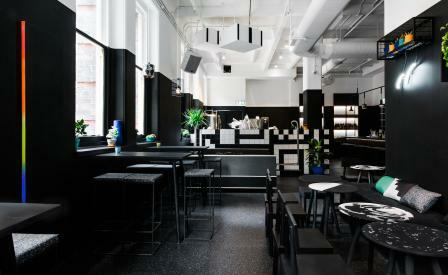 Having spent 2015 road testing their product across Sydney’s best restaurants and bars, two beverage-mad ex-bar managers, Thor Bergquist and Michael Chiemm, alongside RCA-trained designer Livia Lima, opened the doors to PS40, swiftly followed by the launch of their own line of hand crafted PS sodas. Free from preservatives, artificial colours and flavours, the PS sodas are made, bottled and poured in-house while also being distributed to restaurants and bars across Sydney, Melbourne and Perth. A core range of flavours made from local and indigenous produce - including Blackstrap Ginger, Grapefruit Gentian, Wattle Cola, Bush Tonic and Smoked Lemonade - are complemented by seasonal ingredients, starting with PS Zombie, which draws influences from the classic tiki cocktail.